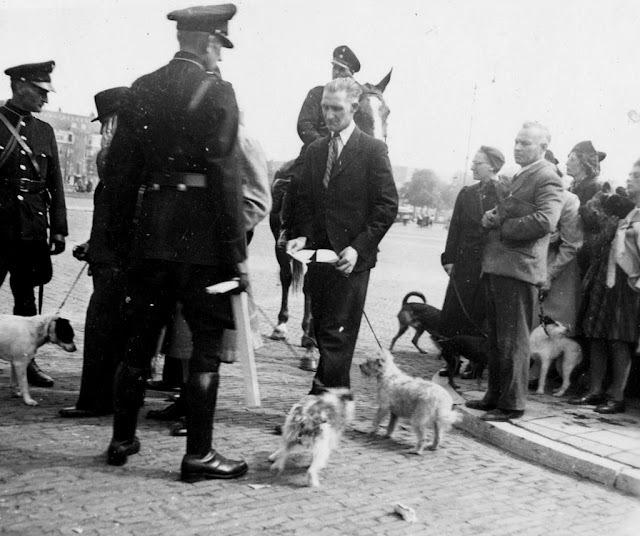 The police is confiscating dogs, Amsterdam July 1942 by Karel Bönnekamp (Resistance Museum Amsterdam). Everybody, at least in Holland, knows that the Germans confiscated nearly all bicycles during WWII and transported them to Germany. Until quite recently, when a Dutchman wanted to express he was still angry because of the occupation, he would say 'Give back my bike!'. But the Germans snitched more than just bikes, also dogs were taken of their owners. The dogs were used for the clearing of mine fields. Every dog owner had to report, but only the large dogs were confiscated, since the mines needed a certain amount of pressure to detonate. This photo was secretly made by amateur photographer Karel Bönnekamp, a member of the resistance. He made pictures of the shady businesses of the Germans. When I first saw this picture I was shocked, it was the first time I heard about this. It is another example of the hard times the previous generations experienced during the war. More old photos involving dogs can be found at Sepia Saturday. It makes sense when you mention that the Germans would want the dogs, but I had never heard about this before now. Very interesting piece of news indeed. Thank You very much, Rob, for Your comments in my blog. I have appreciated them a lot. I wanted to inform You that Your site is now proudly linked from the home page of my blog about borders (left sidebar; the order of the list depends on the most recent update). All good wishes and congratulations. Thank you Italian Estonian Blogger, much appreciated! Seventy years ago and it still breaks my heart. If someone took my dogs from me I don't know what I would do. I had never heard of this either. I’d never herd this before, but I am not shocked or surprised, knowing how human beings were treated, dogs would be very much more disposable. It’s a sad picture though and clearly the photographer was taking a great risk. I find it shocking and sad that this would happen. I did not know this. But I am of a younger generation who did not grow up with the war. That must have been very upsetting (to say the least) to the owners. I had never heard of the bicycles being taken or the dogs. I guess they were lucky they didn't decide to use people to check for mines. I researched American war dogs for my post this week. Here people voluntarily donated their dogs for the war. I hope none of them were blown up when clearing minefields. Even the dogs look reluctant to be handed over. Not a German Shepherd amongst them, I wonder why. I join the crowd of the uninformed too. Thanks for this bit of history. You're probably in the running for the most eye-opening jaw-dropping post for Sepia Saturday. Oh, my gosh, I didn't know anything about this either. What a photo and story you have for us this week. How awful. My post also has to do with animals and children during World War II...the unwilling participants. What an interesting/odd story. Fantastic photo though, even though what was happening was horrible. How absolutely fascinating - it is certainly an aspect of wartime history I didn't know. Perhaps I can use the example to help persuade my dog Amy to go on a diet! Never heard this bit of history before. War is not good for man or beast. Horrible. A fascinating photograph and a very brave photographer! Oh my word, you can see the sadness on that man's face, giving up his little pups. Incredible picture documenting history. A very good Dutch friend of mine gave me a family postcard collection dating from around the war years. I've learnt a lot of what went on during the occupation but I didn't know about the dogs. How dreadful. How tragic! Who knew that something like this was happening? You have a very informative blog. A small piece of history that explains far more about the German occupation. It is sobering to imagine a photographer risking his life to take this photo. How could the Germans find time to organize such a dog pogrom? I think I read about this many years ago, it sounds familiar but it's still a shock to know they did that. I thought I had heard everything horrible about that war but this makes it even more heartbreaking. @Jo: A medal for Simon the Cat, that's interesting. I will look into it. @Linda: 'Informative', that sounds nice, thanks. Lord! I Had Never Heard Of This Practice.I Guess It True,That You Can Tell A Lot About People By The Way They Treat Animals&pets. Unfortunately they used people for even worse things. Let's pray WWIII will never happen.